Although blank now, the side panels on Charlotte's city buses and trains will start advertising to raise revenues for the transit system. Photo by Willamor Media. The Charlotte-Area Transit System (CATS) signed a five-year, $2.6 million contract with Titan, a transit advertising company, to allow advertisements on its fleet of buses and light rail. The agreement gives Titan the exclusive right to sell and manage advertising on the city’s public transit vehicles. The contract will allow exterior and interior advertising for buses and exterior advertising on the CATS light rail system. In return for the exclusive right to prime transit real estate, Titan guaranteed a $5 million profit to CATS in a span of five years. 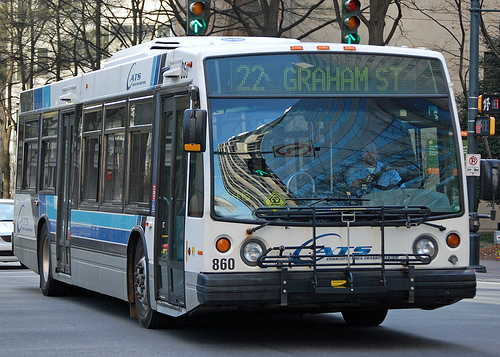 CATS removed advertisements from its public transit vehicles in 2000 because the project was not cost-effective. CATS Marketing and Communication Manager Olaf Kinard believes the project will be more successful this time around because of the growth in Charlotte’s transit system. According to WSOC-TV, an ABC-affiliated television station in Charlotte, CATS’s fleet of buses grew from 120 to 330 since 2000. The LYNX Blue Line, the region’s first light rail service, is also a fairly new addition to the region’s public transit system, having started service in 2007. Overall, CATS provides transport to 25 million people annually with 70 bus and light rail routes. This is an especially lucrative time for companies to advertise in Charlotte since the 2012 Democratic National Convention is scheduled to be held in the city’s Time Warner Cable Arena on September 3, 2012. Charlotte is not alone in offering transit real estate for advertisements. New York City makes subway cars, buses, stations, panels on entryways to stations, and even the backs of metro cards available for advertisements, exposing these messages to millions of people who ride public transit every day. But what do these advertisements mean to commuters? Kinard explains that the profits from this service can help cover costs, which could avoid an increase in fares. “It helps us manage our costs, especially with rising fuel prices,” he said in the interview with WSOC-TV.